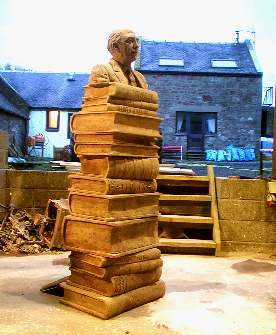 Above picture shows the Sir Alexander Stone bronze memorial casting in John McKenna's studio foundry at www.bronzecasting.org.uk prior to waxing. Scroll below navigation bar for mor pictures and information. 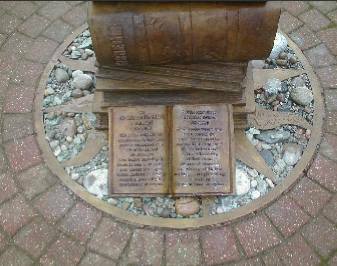 This sculpture was commissioned through a limited competition by the Hutchesons' Grammar school, in Glasgow for the centre piece of a memorial courtyard garden at the school. The finance for the memorial to the late Sir Alexander, who was a former pupil of the school was generously donated by Lady Bette Stone, widow of Sir Alex. 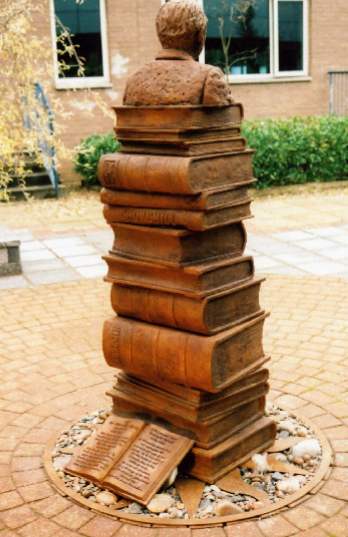 John McKenna was shortlisted for the commission to create a sculpture to set an existing portrait (Lyons) upon to allow it to be exhibited within a landscaped garden setting. After careful consideration John's water feature design was selected for the existing portrait head which had been lost in long term storage, out of view of the school population but was to be restored. Sir Alexander created a memorial library at Glasgow University which contains his collection of antiquarian books, a source of reference for John's book plinth upon which the Lyon portrait bust rests. 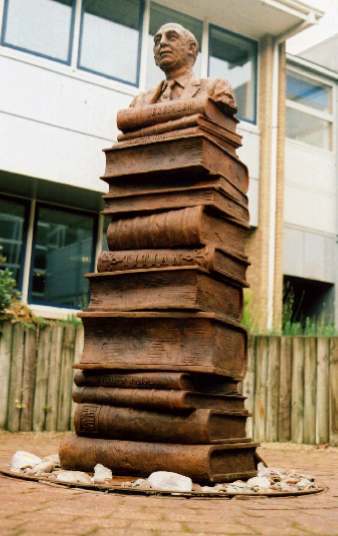 Unusual bookbindings and titles of the antiquarian collection were portrayed in McKenna's bronze book stack plinth. This unique sculpture was commissioned by Lady Bette Stone to commemorate the life of her beloved husband Sir Alexander. From humble beginnings in Russia he went on to achieve great success as a lawyer, banker, businessman through strength of personality and determination of purpose. Sir Alexander Stone’s long and successful life encompassed most of last century. He is remembered for his fortitude and determination in difficult times, his sense of adventure, his patronage of the Arts and his generous philanthropy through the Alexander Stone Foundation.